SACRAMENTO, CA – Every November, the United States honors its service members on Veterans Day. This national holiday serves as an opportunity for us to remember our nation’s veterans and to be thankful for our freedoms. This year’s Veterans Day falls on 11/11/11. Most importantly, this year marks the beginning of our nation’s 11th year of engagement in Afghanistan. As a result of our engagement in recent conflicts overseas, many veterans return home, as our newest heroes, just as others did before after other conflicts. This is why the California Department of Veterans Affairs will be profiling eleven veterans beginning November 7th thru Veterans Day. These profiles will include veterans from different generations and backgrounds and hopefully shine a light on the challenges our veterans have and continue to face. Bea Hirschkovici was born in 1910 in Bucharest, Romania. She remembers well her family’s migration from Romania to the United States in 1920. Hirschkovici’s family made the journey to Fort Worth, Texas by sailing from France and registering in Ellis Island. Hirschkovici remembers the difficult times that World War I had created in Europe and was thankful for the opportunities and safety that the United States offered. In 1929 she and her family moved to California where she lived until she enlisted in the Army at the beginning of World War II. 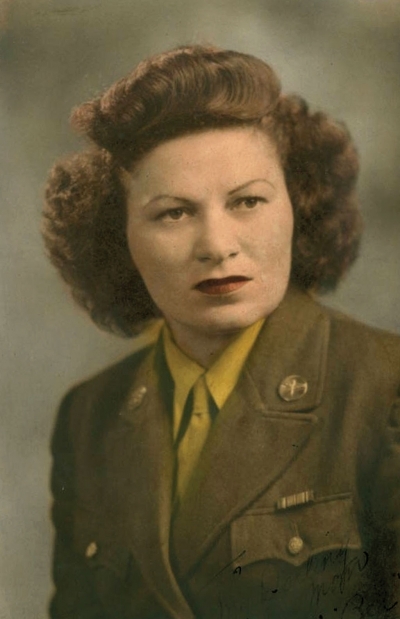 Hirschkovici was sent to Des Moines, Iowa to serve in the Women’s Auxiliary Core which later became the Women’s Army Core before being sent overseas to Scotland where she served as a Private First Class in the communications department working with top secret mimeographed documents. In 1945, Hirschkovici returned to Los Angeles where she met her future husband a former POW, Ray Cohen. After her service in the military Hirschkovici got heavily involved in veteran causes which she still participates in till this day. This year she celebrated her 101st birthday. CDVA: What was the most memorable thing about your service? Hirschkovici: The training at Buckley Field in Denver, Colorado. I remember learning discipline, learning respect, being an American and realizing what America meant to me. Also, meeting the other women soldiers all over the United States. I also remember being on a train on June 6, 1944 and the sky became filled with planes and gliders. It was the Normandy invasion, only we did not know it at the time. It was the beginning of the end of World War II. CDVA: What made you want to join the military? Hirschkovici: I wanted to pay America back for having become an American. I came to this country in 1920 as a Rumanian immigrant. I was proud to be an American and I still am. CDVA: What if any effect did being in the military have on your family life? Hirschkovici: Being in the military gave me an extended family. I am proud of having been a member of the military. There is camaraderie among other veterans and we have so much in common. When I am sitting outside the VA hospital for a cab to take me home, and Veterans are sitting right beside me, we always talk about our service and experiences. I feel so home among other Veterans. The VA is my second home. Aaron Araiza was born and raised in the Sacramento Valley where at the age of 17 he and his twin brother entered into the United States Marine Corps. Araiza attributes his desire to join the Marines to his positive experiences in Boy Scouts and other community service programs. Injury (TBI) and was diagnosed with Post Traumatic Stress Disorder (PTSD). 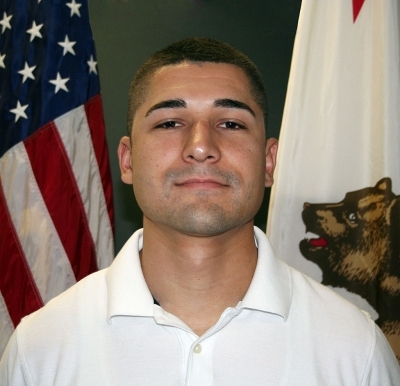 After returning home from Iraq and receiving an honorable discharge, Araiza has began to utilize the education benefits while working as both a security guard and a work study intern at the California Department of Veterans Affairs. CDVA: What made you want to join the Marines at the age of 17? Araiza: I was a Boy Scout most of my life and I think I enjoyed it so much because it was about service and discipline things that I knew I would find in the military. Also I knew that I wanted to go to college and felt that joining the military and pursuing my education after my service was something I really wanted to do. The education benefits are wonderful and I am thankful that the United States thanks its servicemen by providing them with education benefits. CDVA: What was the most difficult part of your service? Araiza: I would say the hardest part is being away from your family. I have a twin brother, and once we both were given different assignments it was the first time in my life I had been away from him. It is extremely difficult at first when you go to some base to train but even more difficult when you are halfway across the world from your brother who is also your best friend. CDVA: What advice would you give to other members of the military about to leave service? Araiza: I would say to form a plan well before they are out of their service. The economy is hard out there and colleges are impacted. I learned when I got out that jobs weren’t easy to find and that I needed a timeline for my education. Our benefits are good but things just won’t fall into your lap. I have a son and I feel confident that the plan I have in place will help to provide for my family as long as I stay diligent and work hard at it. The West for nearly a decade has worried about Iran’s uranium enhancement, believing Iran is working on a nuclear bomb, though the government maintains its uranium is only for peaceful purposes. When Iran began its nuclear program in the mid-1980s, I was working as a spy for the CIA within the Revolutionary Guards. The Guards‘ intelligence at that time had learned of Saddam Hussein’s attempt to buy a nuclear bomb for Iraq. Guard commanders concluded that they needed a nuclear bomb because if Saddam were to get his own, he would use it against Iran. At that time, the two countries were at war. Still more evidence of Pakistan's double game. Pakistan has been accused of playing a double game, acting as America's ally in public while secretly training and arming its enemy in Afghanistan according to US intelligence. In a prison cell on the outskirts of Kabul, the Afghan Intelligence Service is holding a young man who alleges he was recruited earlier this year by Pakistan's powerful military intelligence agency, the ISI. He says he was trained to be a suicide bomber in the Taliban's intensifying military campaign against the Western coalition forces - and preparations for his mission were overseen by an ISI officer in a camp in Pakistan. SACRAMENTO, CA – Governor Edmund G. Brown Jr. today announced the appointment of John Farrell and Alexander Tsao to the California Veterans Board. John Farrell of Chula Vista is currently a resident of the Veterans Home of California, Chula Vista. Farrell was a private practice attorney from 1983 to 2004. He was a partner at Exarhos and Farrell from 1975 to 1983 and an associate attorney at Milch Wolfsheimer and Wagner from 1974 to 1975. He was a sales manager from 1963 to 1973 and lab technician from 1957 to 1960 at Thompson Photo Service. Farrell was a specialist fifth class in the United States Army serving as a public information officer from 1960 to 1963. Alexander Tsao of North Hollywood, has been partner at Venerable Counselors at Law since 2010. Tsao was a senior associate at Alston and Bird from 2007 to 2010. Tsao was a captain in the United States Marine Corps serving as a judge advocate from 2004 to 2007. Tsao was an associate at the Law Office of Arnold G. Regardie from 2003 to 2004. The California Veterans Board serves as an advocate for Veterans affairs identifying needs and working to ensure and enhance the rights and benefits of California Veterans and their dependents. Camarillo, CA - CSU Channel Islands (CI) has been named a “Military Friendly School” in an annual list that highlights colleges and universities who are doing their best to recruit, retain and support military veterans. The ranking, which resulted from a survey of more than 8,000 institutions nationwide, places CI in the top 20 percent of all colleges and universities for its military friendliness. The annual list is compiled by G.I. Jobs magazine, a respected, veteran-owned publisher that targets members of the military. In its 2012 listing, G.I. Jobs commends CI for practices such as offering veterans priority registration and transferring help, assistance with G.I. Bill benefits, a Vet 2 Vet mentoring program, two student organizations, customized orientation and academic advising sessions, a veteran-oriented workshop series, a resume-writing service, and a campus Veterans Resource Center where veterans can study, socialize and meet with advisors. For more information on CI’s veterans affairs programs, contact Jay Derrico, Veterans Affairs Program Coordinator, at 805-437-2745 or jay.derrico@cusci.edu. To view the 2012 Military Friendly Schools list by G.I. Jobs, visit http://www.militaryfriendlyschools.com. The California Department of Veterans Affairs (CalVet) has received $142 million from the U.S. Department of Veterans Affairs (USDVA) for construction of the Fresno and Redding Veterans Homes. CalVet will receive $92 million for construction of the 300-bed Veterans Home of California in Fresno and $50 million for construction of the Veterans Home of California in Redding. California will provide approximately $49 million for construction of the Fresno Veterans Home and $27 million for the Redding Veterans Home. “We are all grateful that the USDVA has agreed to release the funding for our continued construction and procurement for completion of our Redding and Fresno State Veteran Homes,” said Robin Umberg, CalVet Undersecretary for Veterans Homes. The Fresno Veterans Home’s design veers from a traditional shared-room floor plan to private rooms for veterans, which include special features designed to promote an intimate, residential ambiance. This veterans home will bring more than 400 jobs to the Fresno area. CalVet reminds veterans in need and their families that they have the option of using one of the other California Veterans Homes located in Barstow, Chula Vista, Lancaster, Ventura, West Los Angeles, and Yountville until our Redding and Fresno Homes are up and running. Please go to www.calvet.ca.gov/VetHomes/Default.aspx for more information. The Veterans Home of California – Fresno will be located at 2811 West California Avenue, Fresno, CA 93706. SACRAMENTO, CA – Secretary Peter J. Gravett, California Department of Veterans Affairs (CalVet), today praised Governor Brown for acknowledging the contributions and special needs of veterans who make California their home, when he signed legislation that will expand housing options for veterans and extend the priority registration for veterans going to state colleges and universities. CalVet thanks Assemblymember V. Manuel Pérez (D-Coachella); Assemblymember Mike Davis (D-Los Angeles); and the Committee on Veterans Affairs for carrying these pieces of legislation. AB 697 by Assemblymember Pérez gives specific authority for CalVet to provide refinancing opportunities under the CalVet Home Loan Program to eligible veterans who are not current contract holders. The mortgage crisis has impacted veterans who have mortgages at financial institutions outside of the CalVet Home Loan Program, and who are subject to rising interest rates as a result of adjustable rate mortgages. This bill will allow those veterans to refinance their loan, as long as the loan is in good standing, not upside down on the value of the house and would make good financial sense for both the CalVet Home Loan Program and the veteran. AB 1084 by Assemblymember Davis will expand the definition of “home” as defined in the CalVet Farm and Home Loan Program to include “cooperative housing corporation.” This bill will allow CalVet to engage in a greatly needed service utilizing proven housing finance options for low and middle income people and is a pragmatic and beneficial method for housing veterans and their families, reducing homelessness among veterans and improving the economy. SB 813 by the Senate Committee on Veterans Affairs will increase the time veterans attending California’s public institutions receive priority enrollment from two to four years to facilitate the maximum and efficient use of veterans federal education benefits. This change in statute will help alleviate the difficulties veterans face when they attempt to coordinate their federal education benefits, such as the Post 9/11 GI Bill, with registration for enrollment in classes at one of California’s public colleges or universities. By extending the priority enrollment time frame, not only will veterans maximize their Post 9/11 GI Bill funding, but California will receive more federal veteran education money in a time when the State’s colleges and universities are in need of additional resources. The Navy’s former top civilian has rocked the service in a military journal article by accusing officials of sinking the storied naval air branch into a sea of political correctness. Former Navy Secretary John Lehman, himself a former carrier-based aviator, wrote that the swagger and daring of yesterday’s culture has given way to a focus on integrating women and, this year, gays. Sacramento, CA - The California Department of Veterans Affairs (CalVet) is seeking partners to help the California Interagency Council (the Council) on Veterans improve the coordination of veterans services across governmental and private sectors. The Council is tasked with identifying and prioritizing the needs of California’s veterans and to coordinate the activities at all levels of government in addressing those needs. To ensure that the council is successful, CalVet requests that representatives from local government, charitable organizations, private healthcare and any other organizations that work with veterans contact the department if they are interested in an active role with the Council. Membership is limited but the department is seeking the input of organizations with demonstrated success delivering services to California’s veterans. Executive Order B-9-11 directs the Secretary of the California Department of Veterans Affairs to establish the Council and work to immediately prioritize the needs of California’s 2 million veterans, with a focus on streamlining the way services are delivered. To be a partner in the Council’s effort, please email CalVet at PAO@CALVET.CA.GOV, with the name of your organization, background and contact information. Los Angeles, CA – A “Bikers Helping Veterans” 9/11 West Coast Motorcycle Charity Ride to benefit the new Veterans Home of California in West Los Angeles, will be held on September 11, 2011 from 10 a.m. to 3 p.m. at the Veterans Home located at 11500 Nimitz Avenue in Los Angeles. The benefit ride is sponsored by Barger and Bartels Harley-Davidson dealerships, the Westside HOG Chapter and participating dealerships – and is the first fundraiser for the Veterans Home of California—West Los Angeles, the largest Veterans Home in Los Angeles County. The event is being held on the 10th anniversary of 9/11. Victims and heroes of 9/11 will be honored and remembered. “This will be a wonderful way to remember those men and women in the U.S. Military who sacrifice so much for us every day and to honor those men and women who died on that fateful September day 10 years ago,” said Peter J. Gravett, Secretary of the California Department of Veterans Affairs. A patriotic program, flag ceremony, vendors, music, lots of food, raffles and celebrities are all part of the day’s event. Commemorative t-shirts, caps and pins will also be for sale. All proceeds will go to the Veterans Home residents’ welfare and recreation fund, and used for such items as electronic and board games; movie, theater or sporting events tickets; arts and crafts; recreational equipment; computers; trips and more -- anything that might improve the quality of life for Veterans Home residents. For an entry form, information on group rides from dealerships, time, route map and directions, please log on to www.bargerharley-davidson.com or email calvetcharity@gmail.com. The Veterans Home of California—West Los Angeles is a newly constructed, stunning 396-bed, long-term care facility located adjacent to the VA Hospital in West Los Angeles. The Veterans Home provides California veterans with a living environment that protects their dignity and contributes to their feeling of self-reliance and self-worth. The Veterans Home offers two levels of care that provide continuity in the lives of residents in a homelike atmosphere of dignity and respect: an Assisted Living Unit, now open; and a Skilled Nursing Unit with memory care is estimated to open in 2012. Amenities include: room and board – three meals plus snacks; medical care and medications; optical care, dental care and podiatry services; transportation services to all medical appointments and off-campus activities; a beauty/barber shop, multi-purpose room; limited banking services; opportunities for worship for all denominations; a modern fitness room and exercise classes; restorative therapy center; libraries; cable television; housekeeping and laundry services; a caring and compassionate staff; a variety of community outings; and an enhanced activity program. For information on the Veterans Home of California—West Los Angeles, please call toll-free at 877-605-1332 or log on to the CalVet website at www.calvet.ca.gov. For more information on the 9/11 West Coast Charity Ride “BIKERS HELPING VETERANS,” please log on to www.bargerharley-davidson.com or email calvetcharity@gmail.com.